The inspection tour at the Chai Ya Nuchit Pump Station. Fifty two people attended the pump seminars that Ebara Corp held in Bangkok, Thailand from 30 August to 5 September 2018. The participants, mainly engineers, came from six countries: Thailand, Vietnam, Bangladesh, Cambodia, Philippines, Sri Lanka. During the pump technology for the water supply system-themed seminar, Ebara held lectures on determining the specifications of intake and supply pumps and comparison of energy-saving operations of pumps. 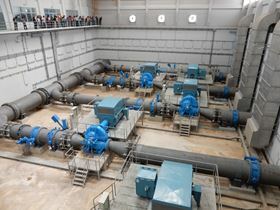 The group also undertook an inspection tour of a water treatment plant and intake pumping station at the Chai Ya Nuchit Pump Station in the Bangkok suburbs. Five Ebara pumps at the Chai Ya Nuchit Pump Station take the river water and send it to the Bang Phra reservoir, about 58 km from the pump station. The water stocked in the reservoir is used for waterworks, industrial water and irrigation water. This was the 28th time that the Japanese pump company held seminars in cooperation with the Asian Institute of Technology (AIT).